Look past all the things you think you know, and learn what Deaf culture really means. I grew up adoring my aunt, who stayed with my family many weekends, and eventually moved in with us a few years ago. She's deaf, but also cognitively delayed, meaning she'll permanently function at the level of an elementary or middle-schooler. Because of her cognitive delays, my aunt didn't have the typical "deaf upbringing" she might have had. She's never really been a part of Deaf culture. Of course, she has some things in common with other deaf adults - she prefers physical affection, loves seeing friends and hates saying goodbye to them and chooses movies with physical action or humor. But as someone who interacted on a daily basis with a deaf woman and spoke conversational sign language, I knew very little about Deaf culture when I went to college. Last year, I took a Deaf culture class that taught me so much about the lives of deaf Americans, signed languages, customs and cultural expectations. I realized then how much most hearing people don't know or incorrectly assume about deaf people. 1. There are only two countries that use predominantly ASL. The United States and Canada are the only two countries who primarily use American Sign Language. French Sign Language was the basis for ASL and the two still share plenty of similarities, though they also differ in plenty of ways. However, according to The Ethnologue, there are around 130 recognized Deaf sign languages in the world, though there are also other undocumented sign languages out there too. Long story short, deaf people can't just go to any country and automatically communicate with other deaf people. Sign languages aren't universal. There is an International Sign Language, but it's not widely used outside of worldwide meetings, such as the World Federation of the Deaf Conference. 2. 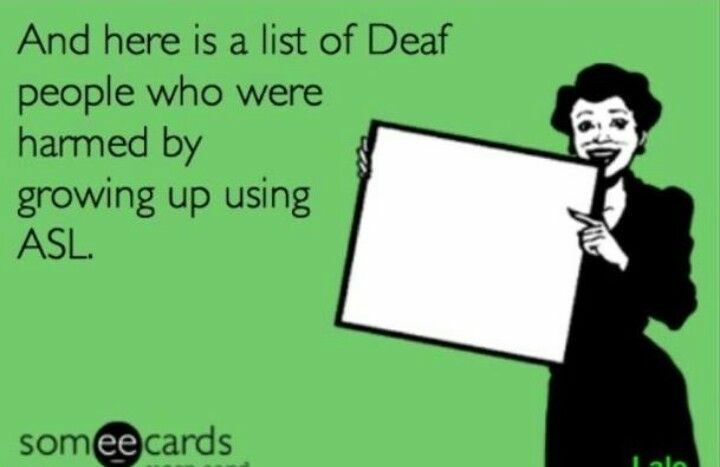 Deaf people are typically better drivers. Plenty of people assume that those who can't hear also can't drive. The opposite is true. 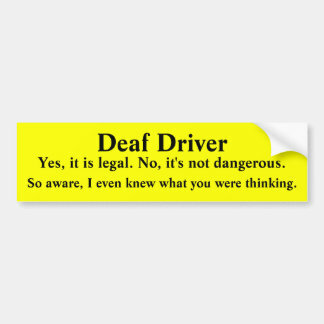 Statistics have proven that most deaf drivers are equal to or better than hearing drivers. This could potentially be because noise distractions don't exist for them or because they rely so much more on visual signals, which is what driving is primarily based on. 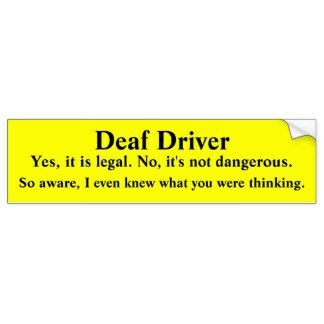 While deaf drivers are proven to be perfectly competent, there are a number of other countries around the world that don't allow their deaf citizens to drive. 3. Deaf culture has its own films, "music," dance, poetry, literature and folklore. Like any country, community or cultural group, Deaf culture has its own forms of art and entertainment. For example, deaf poetry is a 3-D art form (performed both in video and at live events), using hand shapes, hand locations, body movements and facial expressions to tell a poetic story. There are also a multitude of books written by deaf adults, films with entirely deaf actors and videos that blend sign language with things like music or dance. 4. "CODAs" are a go-between for two separate cultures. 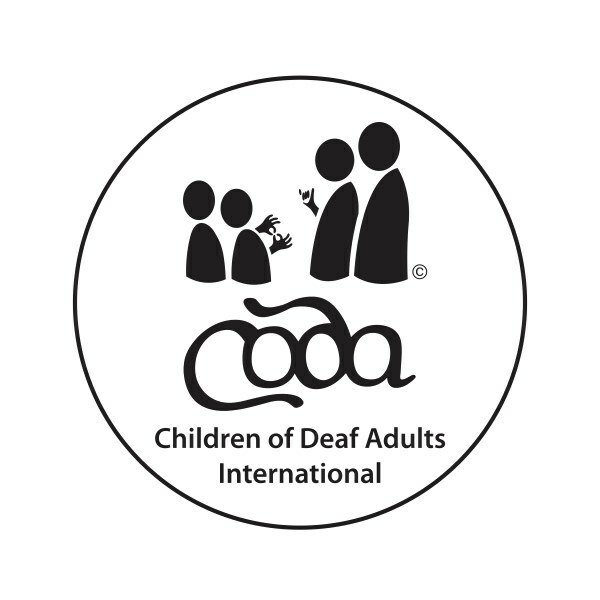 CODA is an acronym for Children of Deaf Adults, meaning a hearing child born to one or more deaf parents. It's actually quite common for deaf people to give birth to hearing children, as deafness is not typically genetic. CODAs have the opportunity to live between Deaf culture and hearing culture, which can be both a blessing and a curse. They usually have the benefit of being fully bilingual, but can also struggle with learning to verbalize words at a young age, and in many cases need speech therapy when entering school. They also often take on the role of their parent's interpreter from a young age, which can teach skills, but also can be too much responsibility and information for a child to be exposed to. There is a fascinating piece here, written by a CODA about some of his experiences. 5. Name signs are usually personal and treasured. My own experience with name signs is different from the more typical Deaf culture name sign experience. My aunt, as a deaf adult who is also cognitively delayed, is unaware of the importance that other deaf people place on name signs, and has always taken a much more simple approach. She gives each person she meets a sign that is essentially the first letter of their name held against her cheek, shoulder or the top of her head. However, more often in the Deaf Community, name signs are a gift. They are given to non-deaf friends or family only when the deaf person feels they've earned a name sign and their trust. Some other deaf people do use the person's initials, though often in other locations or combined with some other personal characteristic. Other people choose to create their own personalized name sign based on a physical feature, personality trait, habit or inside joke. The signs are particularly treasured and take time to be chosen. 6. Deaf people are generally proud to be deaf. While much of "hearing America" looks at deaf people with pity and thinks of deafness as a disability and hardship, members of the Deaf Community don't see it that way at all. Many of them hope to have deaf children who will also become strong members of the Deaf Community. The culture is incredibly close-knit, encouraging and open by nature. Deaf people share much more with their friends and neighbors than someone hearing usually would. But the most important thing to take away from all of this is that if deaf people don't think of themselves as disabled, hearing people shouldn't think of them that way either.